Master the Cali-Mex classic with some pro tips from Dos Toros founder and burrito expert Leo Kremer. 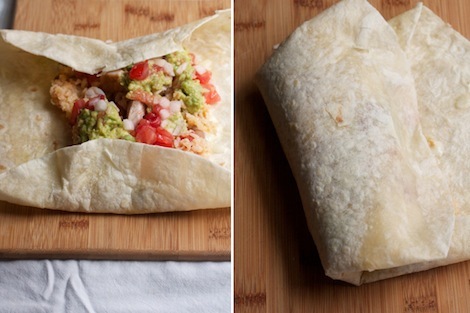 To craft the perfect burrito, stop thinking about cooking. Transport your mind from the cocina to the factory, and starting imagining an assembly line instead of a stove or a cutting board. This little exercise will help you see two things: Firstly, that the burrito is the complicated and delicious sum of many simple parts, and secondly, that you’re well served by making a lot of burritos at once. “Making one burrito is like making one car,” says Leo Kremer, co-owner of Dos Toros, a San Francisco-inspired burrito restaurant with five New York City locations (fun fact: he’s also a former Third Eye Blind bassist). As with, um, car manufacturing, there are a lot of parts to a burrito—rice, salsa, beans, meat, and cheese, to name a few—and each is best made separately and in bulk. 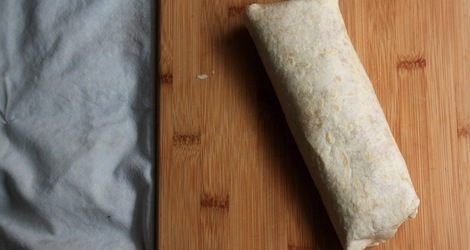 With the exception of wrapping, the burrito doesn’t require extremely difficult technique at any one assembly line station. Rather, the challenge is to make a whole lot of perfectly seasoned parts that can stuff—but not overstuff—a flour tortilla, keeping them all at the right consistency, texture, and proportion. It’s a serious endeavor, but the flour-wrapped Cali-Mex bundle that results is so delicious you shouldn’t abandon your at-home burrito-making ambitions. Just enlarge them. Since “it’s difficult to make small amounts,” says Kremer, you should have a burrito party. “Make burritos for 10 friends,” he advises. Here’s how to do it. The flour wrap that defines the burrito (and separates it from the single-carb “burrito bowl”) evolved in Mexico in the centuries following wheat’s arrival there from Europe, in the 1500s. By the early 20th century, farmers in the Mexican state of Chihuahua found that wheat grew far better than corn in their soil. 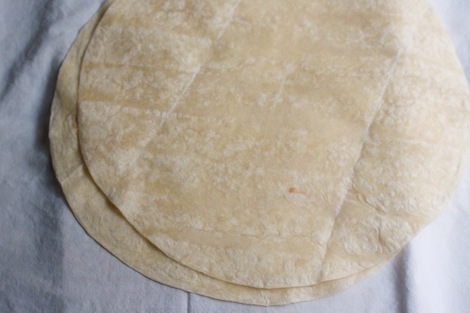 Because of the elasticity of wheat dough, tortillas can be rolled out into far larger circles than with corn dough, and one day in Chihuahua, a cook rolled a big flour tortilla around some meat, and, according to historian Richard Foss, named the wrap “burrito,” after the cute, over-stuffed-looking burro colts that roamed the area. Despite its importance to the burrito, a good flour tortilla is the single hardest part of the burrito for a home cook to source. That’s because just a few Mexican wholesalers make and sell 12- or 14-inch flour tortillas, according to Kremer. In order not to damn your burrito before you ever roll it, skip the mediocre sun-dried tomato wraps from the supermarket. “Go to a nearby tacqueria and ask for flour tortillas,” says Kremer. Near me, two cost $1. Spanish conquistador Hernán Cortés brought both wheat flour and pigs to Mexico. The former became flour tortillas; the latter, the burrito filling carnitas. Rich and soft on the inside, crisp on the outside, carnitas (slow-cooked pork shoulder) is as good as it gets when it comes to the meat inside a burrito. Steak (choose skirt or hanger) and chicken (go for the thigh meat) are also good bets. To prepare them, do as little as possible: Grilling the steak, roast the chicken (or buy a rotisserie chicken at the store), and cook the pork low and slow for hours. Stick to salt and pepper for flavor. Over-seasoned meat will throw off a burrito’s balance from the get go. 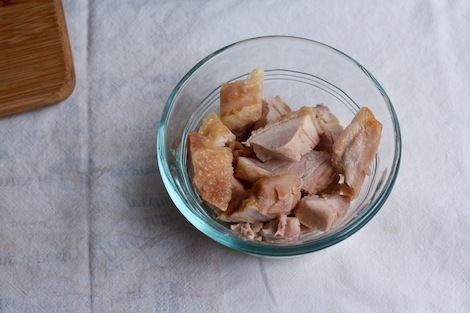 “Let the meat express itself,” says Kremer. For a vegetarian burrito, choose soft-cooked vegetables. Kremer recommend steamed broccoli or zucchini, or sliced, sautéed plantains. 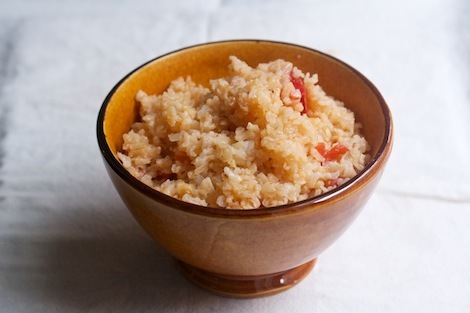 Mexican rice for burritos should be light and fluffy, each grain separate from the next. To achieve flawless rice, soak the grains overnight, then drain them well. Heat oil in a pot, add the rice, and toast until the grains are fragrant and opaque. Then, add slightly less water per serving than the recipe calls for, bring the pot to a boil. Finally, cover, reduce the heat to very, very low, and cook for the amount of time your particular rice package specifies. At Dos Toros, the cooks also add tomato to the liquid. After cooking, salt the rice, but don’t over-salt it. Remember: Burritos want balance. 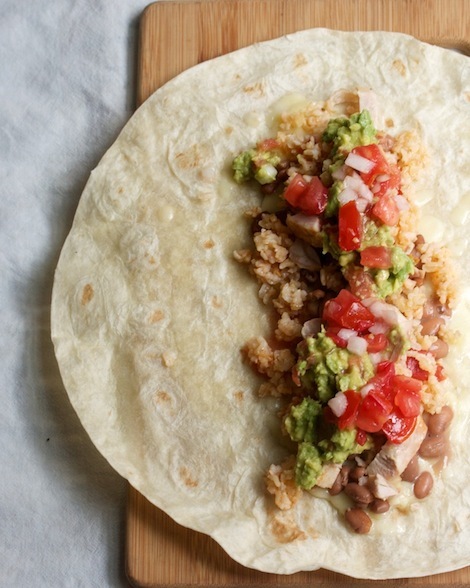 You’ll only need about 1 cup of dried rice to make 6 to 8 burritos. The beans are one of the few burrito elements where Kremer concedes that home cooks can take a shortcut. 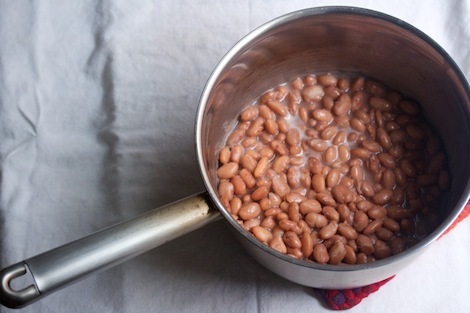 Instead of cooking up pintos or black beans from scratch (as they do at Dos Toros), “warm up a can of beans,” Kremer says. Though blacks beans are twice as popular as pintos at Dos Toros, Kremer prefers the softer, more yielding pinto. Refried beans work well, too. Plan for about 3 ounces per burrito. Here are the sauces to put in your burrito: pico de gallo, guacamole, hot sauce, and sour cream. For the pico de gallo, combine diced fresh tomatoes with minced red onion, chopped cilantro, and some salt. You can add jalapeño, though the burrito makers at Dos Toros don’t, since too many of their customers want burritos easy on the spice. For the guacamole, you must find ripe avocados. As a shortcut, mix a few spoonfuls of the already-made pico de gallo into your mashed avocados. Or, season with onion, cilantro, lime, and plenty of salt. For hot sauce, you can purchase Tapatio or Cholula brands; skip the Sriracha and Tabasco, which deliver harsher heat. 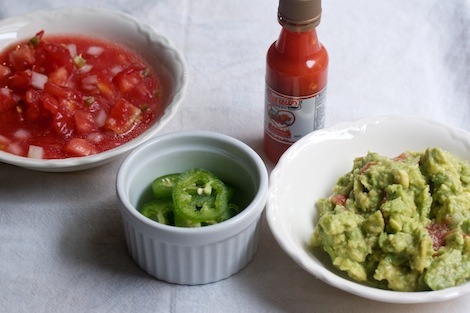 To make your own sauce, boil or grill whole jalapeños and peeled tomatillos, then blend them together into a puree. You can also throw sliced jalapeños onto a burrito for an easier way to dial up the Scoville scale. Finally, find crema from a Mexican market if you can. It has tang and texture that American sour cream lacks. For all the sauces, skip the garlic, or at least go easy, says Kremer. Though garlic is instrumental in so many dishes and cuisines, it can easily throw the burrito’s balance off-kilter. “Our first burrito experiments were garlic bombs,” he says. Before long, they seriously cut the number of garlic cloves going in. Cheese in a burrito should be mild and melted. Monterey Jack and mild cheddar both work. At Dos Toros, Kremer explains, “we have a steamer, a big powerful machine. It steams the tortilla and melts the cheese.” Since we don’t have powerful steamers, home cooks can use a griddle or skillet on medium low. Place the tortilla on the skillet, then arrange the cheese along the middle line. 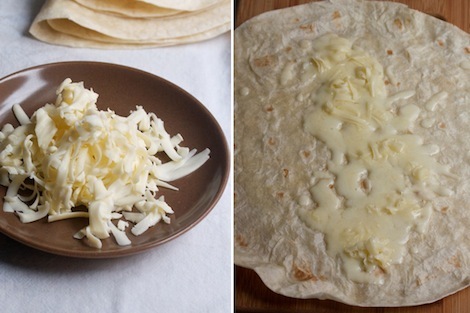 Cook for 2 to 4 minutes, until the cheese is melty and the tortilla is pliable. This, by the way, is not trick meant only for amateurs. In the Mission, in San Francisco, many restaurants use this “skillet style,” which stands in direct contrast to the softer steamed style and marks one of the most serious schisms in the competitive burrito lovers’ world. This is the moment when a burrito becomes more than the sum of its parts. Before assembling, have all the parts ready at the right temperature. You don’t want to be chopping tomatoes for pico while your beans, already loaded, turn the tortilla soggy. Besides prioritizing mise en place, main guideline for burrito assembly, as for pizza topping, is not too much. About 1⁄4 cup of cooked rice and 1/3 cup of beans are a good base for building a manageable, proportional burrito. The more filling, the more impossible wrapping becomes. The assembly order matters, too. To keep the cheese melty, proceed from hot to cold. On top of the line of melted cheese, pile the beans, then the rice, then the meat, then the sauces, ending with the crema. Keep everything constrained to one horizontal line down the middle of the tortilla. And once you’ve dolloped on the crema, assembly is finished. That’s it. Don’t add anything else, especially not lettuce. “Stay away from extraneous things,” advises Kremer. If you’re hosting lots of people, invite everyone to assemble his or her own burrito from the prepared components. A warm tortilla stretches elegantly around the burrito. Even if you don’t have a steamer, work quickly after melting the cheese to preserve elasticity. First, fold in the short ends, the ones that are perpendicular to the lines of ingredients. With the ingredient line parallel to your body, roll the burrito away from you, squeezing the filling in as you pull the bottom edge over the top, keeping the short ends folded in. Tighten, tighten, tighten, as you keep rolling over the remaining tortilla, leaving the overlap at the bottom. 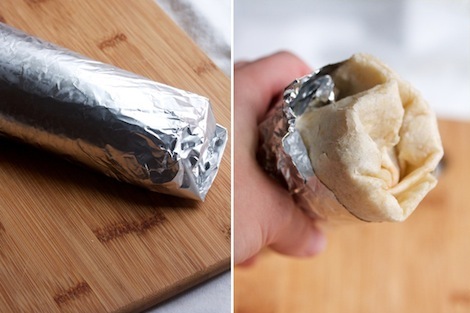 Then, re-burrito your burrito in a rectangle of thin tinfoil. (Meaning: place the burrito in the middle, fold in the sides, then wrap from the bottom up, tucking in the sides, just as you did with the tortilla.) The tin foil will help keep the tortilla warm as you make your way through the meal. To eat, rip a bit of foil from one end and unwind it to reveal an inch or two of the burrito. Bite, chew, swallow, then continue to unwrap to reveal more burrito. Whatever you do, don’t use a knife and fork. A burrito is meant to be a meal in your hand. Burritos are a fusion food—though they have roots in Mexico, they’re hardly authentically Mexican. In fact, authenticity isn’t a word that stands up to the burrito at all. “It’s a Mexican food invented in California,” says Kremer. “So what are you going to be authentic to?” Maybe just the burritos at the taqueria you grew up near—as Kremer’s Dos Toros is loyal to Gordo, in San Francisco. If you’re from Texas, you might pay homage to the “wet burrito,” a concoction that treats the finished dish like an enchilada, topping it with sauce and cheese and baking it in the oven. If you’re from Los Angeles, you might even put kimchi in your burrito. 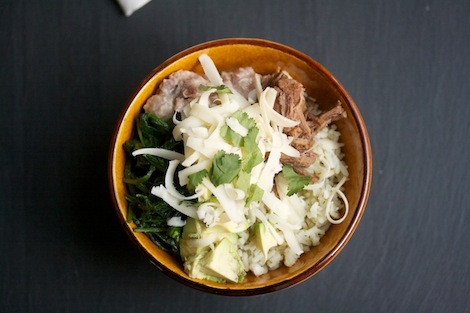 Further outside the bounds, but permissible in these gluten-free days, the burrito bowl is popular because it nixes the tortilla all together; though bastardized, many of the burrito rules apply, namely the balance of flavors and importance of fresh, flavorful ingredients. Skip the tortilla and the assembly, and you’re in business—just not the burrito business, exactly. “The bowl is not the founding innovation,” says Kremer.